1. OxiGreen does some of the deepest carpet cleaning in the industry. Our state-of-the-art carpet cleaning process reaches deep into the fibers of your carpet, a place most vacuums and carpet cleaners never reach. This removes hidden dirt, pollutants, and potential allergens that affect the overall cleanliness of your home and the health of your family. 2. Our cleaning process will lift and restore the natural pile of your carpeting. It will revitalize the matted, high traffic lanes in your carpeting, enhancing the appearance of your entire home. 3. At OxiGreen in Southampton, PA, we are committed to 100% green carpet cleaning. We use biodegradable soaps made from the tea tree, which are safe for your family and the environment, too. 4. All of our carpet cleaning technicians at OxiGreen are IICRC certified. The Institute of Inspection, Cleaning and Restoration (IICRC) is a professional association that trains carpet cleaners throughout the US, maintaining a standard of excellence in the carpet cleaning industry. 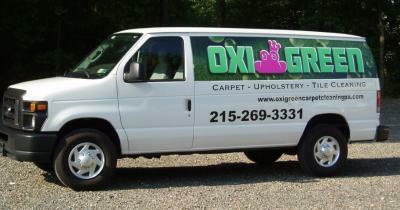 OxiGreen in Southampton, PA has more than 25 years of experience in residential and commercial carpet cleaning. We offer same day service and a fast drying process. Because we are a 100% green carpet cleaning company, no toxic chemical residue is ever left behind. So in the process of cleaning you carpets and improving the appearance of your home or business, we will create a healthier environment for you and your family or your customers and employees. Call OxiGreen today at 215-269-3331. We are available to answer any questions you might have and discuss our money saving package deals. You can also visit us on the web at http://oxigreencarpetcleaningpa.com to learn more about our affordable carpet cleaning and other indoor cleaning services. With a 100% satisfaction guarantee, you can’t go wrong with OxiGreen in Southampton, PA!